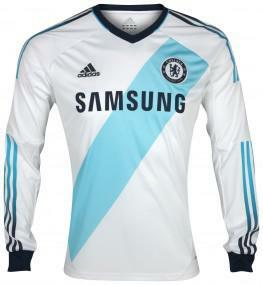 Chelsea Football Club and adidas today unveiled the new away shirt for the 2012/13 football season. The strip combines classic and modern, with an exclusive fading three-stripe design on the arm and a light aqua design element on the front of the shirt, which harks back to traditional football shirt design. The new kit features the first ever fading three stripe design on any adidas designed kit. This exclusive design featuring traditional light aqua contrasts stylishly against the white detail of the shirt creating a jersey that successfully marries the modern and the classic. These light and dark blue shades complement the classic Chelsea Reflex Blue colourway to include many of the colours associated with the club’s recent successes’. The theme is reflected in the collegiate navy coloured Chelsea FC badge, applied with a white satin stitch on both the jersey and shorts. The stylish design is finished off by a collegiate navy rib on the ends of the sleeves and a light aqua piping around the v-neck collar. The 2012/13 shirt again features the adidas Techfit™ technology in the playing shirt which is proven to enhance performance. TechFit™ – The players’ kit will incorporate adidas’ cutting edge TechFit™ technology to help improve speed, increased endurance capabilities and enhanced awareness. This works by stabilising and focusing the muscles’ energy to generate explosive acceleration and deliver maximum power output. Climacool™ -The shirts also feature adidas ClimaCool™ technology, a mixture of heat and moisture controlling materials, ventilation channels and 3D fabrics which improve air flow to the skin in the key heat zones. The new away kit will first be worn during Chelsea FC’s pre-season tour to the USA where they will face the MLS Allstars.